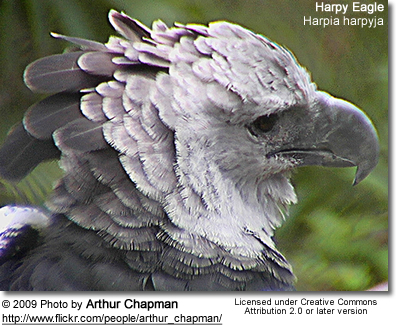 The Harpy Eagle (Harpia harpyja), sometimes known as the American Harpy Eagle, is a Neotropical species of eagle. This species was first described by Linnaeus in his Systema naturae in 1758 as Vultur harpyja. It is the only member of the genus Harpia. It is the largest and most powerful raptor found in the Americas, and among the largest extant species of eagles in the world. It usually inhabits tropical lowland rainforests in the upper (emergent) canopy layer. Its name refers to the harpies of Ancient Greek mythology. These were wind spirits that took the dead to Hades, and were said to have a body like an eagle and the face of a human. 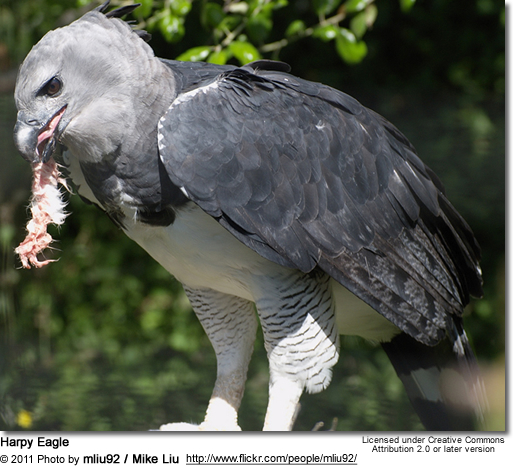 The upper side of the Harpy Eagle is covered with slate black feathers, and the underside is with white. There is a black band across the chest up to the neck. The head is pale grey, and is crowned with a double crest. The plumage of male and female is identical. The talons are up to 13 cm (5 in) long. Female Harpy Eagles typically weigh 6.5 kg to 9 kg (14 to 20 lbs). One exceptional captive female, "Jezebel", weighed 12.3 kg (26 lb), possibly because of relative lack of exercise and readily available food at a zoo. The male, in comparison, weighs only about 3.8 kg to 5.4 kg (8.5 lb to 12 lb). 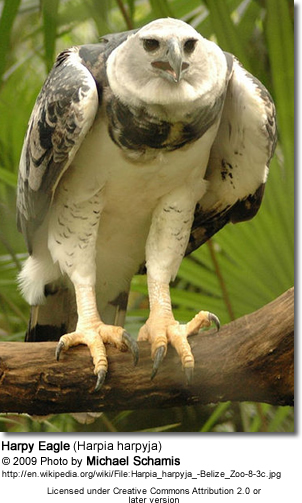 Harpy Eagles are 89-105 cm (2.94-3.43 ft) long and have a wingspan of approximately 200 cm (6 ft, 7 in). Among extant species, only the Philippine Eagle and the Steller's Sea Eagle approach similar dimensions, although the wingspan of the Harpy Eagle is relatively small (an adaptation that increases maneuverability in forested habitats) and is matched or surpassed by other species. The extinct Haast's Eagle was significantly larger than the Harpy. The harpy's talons are extremely powerful and assist with suppressing prey. 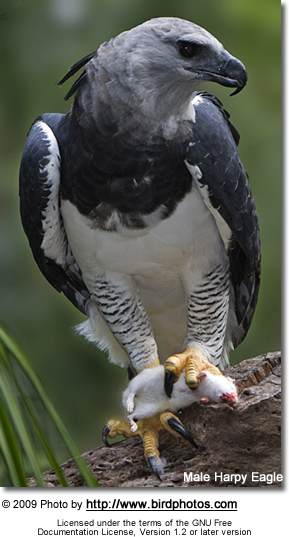 The Harpy Eagle can exert a pressure of 42 kgf/cm² (4.1 MPa or 530lbf/in2) with its talons. It can also lift more than three-quarters of its body weight. A pair of Harpy Eagles lays two white eggs in a large stick nest high in a tree, and raise one chick every 2–3 years. After the first chick hatches, the second egg is ignored and fails to hatch. The chick fledges in 6 months, but the parents continue to feed it for another 6 to 10 months. It can be aggressive toward humans who disturb its nesting sites or appear to be a threat to its young. The harpy often builds its nest in the crown of the kapok tree, one of the tallest trees in South America. In many South American cultures it is considered bad luck to cut down the kapok tree, which may help safe guard the habitat of this stately eagle. The Harpy Eagle is threatened primarily by habitat loss provoked by the expansion of logging, cattle ranching, agriculture and prospecting; secondarily by being hunted as an actual threat to livestock and/or a supposed one to human life, due to its great size. Such threats apply throughout its range, in large parts of which the bird has become a transient sight only: in Brazil, it was all but totally wiped out from the Atlantic rainforest and is only found in numbers in the most remote parts of the Amazon Basin; a Brazilian journalistic account of the mid-1990s already complained that at the time it was only found in numbers, in Brazilian territory, on the northern side of the Equator. Scientific 1990s records, however, suggest that the Harpy Atlantic Forest population may be migratory. Subsequent research in Brazil has established that, as of 2009, the Harpy Eagle, outside the Brazilian Amazon, is critically endangered in Espírito Santo, São Paulo and Paraná, endangered in Rio de Janeiro, and probably extirpated in Rio Grande do Sul and Minas Gerais - the actual size of her total population in Brazil being unknown. Globally, the Harpy Eagle is considered Near Threatened by the International Union for Conservation of Nature and threatened with extinction by CITES (appendix I). The Peregrine Fund consider it a "conservation-dependent species", meaning it depends on a dedicated effort for captive breeding and release to the wild as well as habitat protection in order to prevent it from reaching endangered status. A research project is currently afoot at the National Institute of Amazonian Research, through which 45 known nesting locations (presently updated to 62, only three outside the Amazonian Basin and all three presently inactive) are being monitored by researchers and voluntaries from local communities. A Harpy Eagle chick has been fitted with a radio transmitter that will allow it to be tracked for more than three years via a satellite signal sent to INPE (Brazilian National Institute for Space Research) . In January 2009, a chick from the all but extinct population in the Brazilian state of Paraná was hatched in captivity at the preserve kept at the vicinity of the Itaipu dam by the Brazilian/Paraguayan state-owned company Itaipu Binacional. In September 2009, an adult female, after being kept captive for twelve years in a private reservation, was fitted with a radiotransmitter before being restored to the wild in the vicinity of the Pau Brasil National Park (formerly Monte Pascoal NP) , in the State of Bahia. 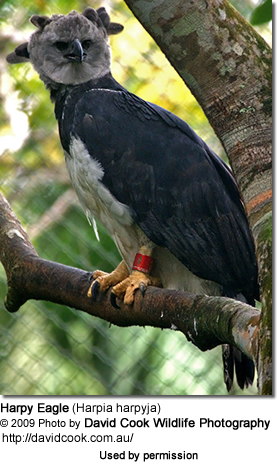 The Harpy Eagle is the national bird of Panama and is depicted on the coat of arms of Panama. The Harpy Eagle is featured on the cover of the O'Reilly Media book, R in a Nutshell. The Harpy Eagle was the inspiration behind the design of Fawkes the Phoenix in the Harry Potter film series. 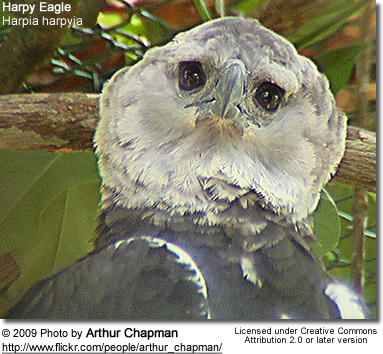 A Harpy Eagle called Bubba features extensively in Garry Kilworth's novel "Frost Dancers" as the adversary of the hares that are the heroes of the book.